Monthly Crafting - Whimseybox (April 2014) ~ Learn, Live, and Explore! 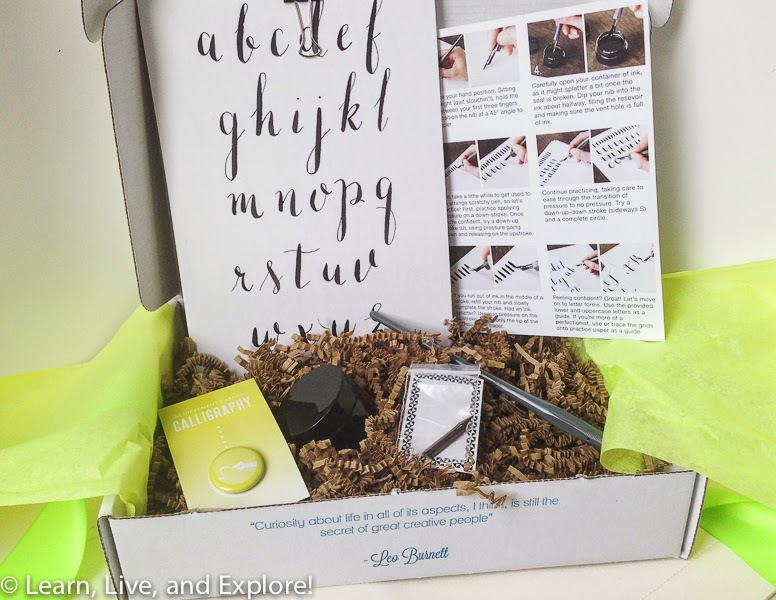 I am loving this Whimseybox monthly craft box subscription. (UPDATE: It appears as if WhimseyBox has gone out of business. Do NOT subscribe) I feel like every time I open the box, it's like my birthday. I love the surprise of the project and the sophistication of the crafting kits. 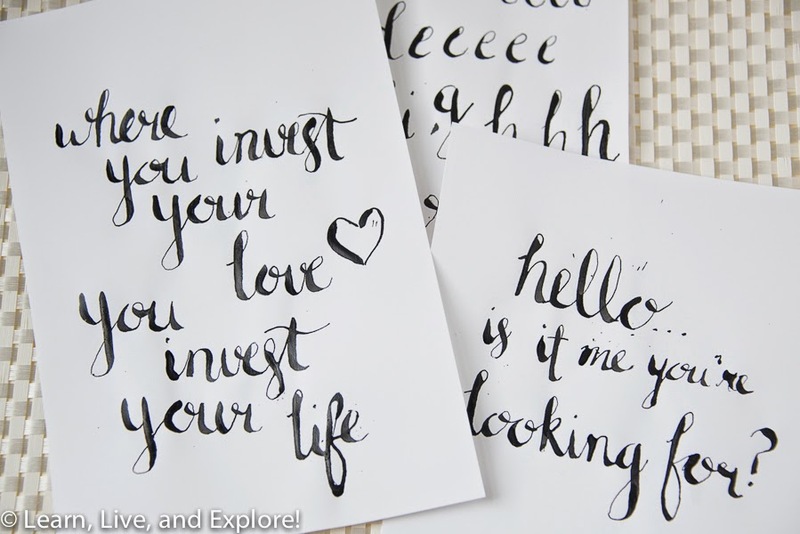 This month was all about learning calligraphy! This is a very handy skill, I think. The kit came with plenty of paper on which you can practice. I think I went through half of the pot of ink before I got tired of playing around with it. Following the instructions, you first attempt to get control over how much pressure to place on downstrokes versus very little pressure on the upstrokes. In fact, when you exert too much pressure on the upstrokes, the tip will easily get stuck and end up flicking ink all over the paper. Just look at my samples as proof of how common that is for a beginner! In the end, I opted to try for my own quote - a favorite from Mumford & Sons. Oh, and a funny quote from Lionel Ritchie before that one. As you can see, I still have some spacing issues, but I have to say it's not that bad for only about an hour of practice! Also, on a side note, I was laughing when I was doing the practice pages because I felt like I was back in first grade learning how to do cursive all over again. Seriously, when was the last time you used cursive besides signing your name?? They even gave you paper to help you perfect your slants! !